In 2007, I published my second paper . 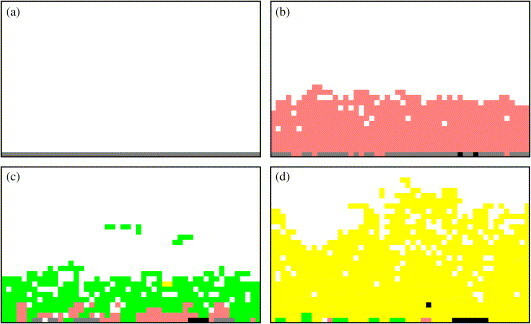 It was a cellular automaton model of carcinogenesis and, in my opinion, my second best paper *. In 2014, Alexandre Sarmento (from Brazil) asked me for the code. Of course I’d lost it. But, amazingly, I’d emailed it to Ornella Cominetti (Chile) back in 2008, and she still had our correspondence. showing the expansion and somatic evolution of neoplastic epithelial tissue. * My best paper is, in my opinion, my first . According to Google Scholar, I’ve now written 52 papers. I’ll leave the reader to perform their own extrapolation. Smallbone K, Gavaghan DJ, Gatenby RA, Maini PK (2005) “The role of acidity in solid tumour growth and invasion” J Theor Biol 235:476-484. Smallbone K, Gatenby RA, Gillies RJ, Maini PK, Gavaghan DJ (2007) “Metabolic changes during carcinogenesis: potential impact on invasiveness” J Theor Biol 244:703-713. This entry was posted in Uncategorized on 27 June 2014 by u003f.